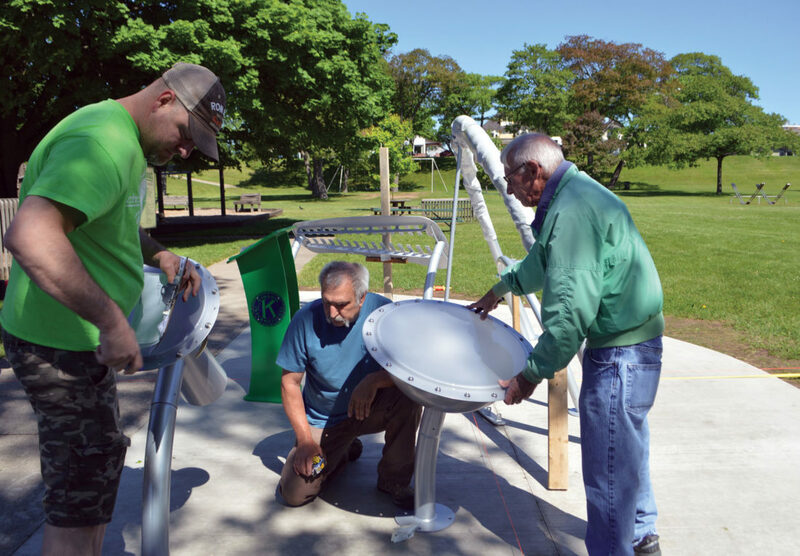 Jordan Beck | Daily Press From left, Penchura Recreation Consultant Doug Smith and Escanaba Kiwanis Club volunteers Warren Isaacson and Dewayne Ide install equipment for a new barrier-free musical play area next to Harbor Hideout in Ludington Park Wednesday. ESCANABA — A new handicap-accessible musical play area has been installed next to Harbor Hideout in Ludington Park. Volunteers with the Escanaba Kiwanis Club were at the park to install equipment for what is known as the Kiwanis Musical Playground Wednesday. The possibility of creating a musical play area was first brought to the attention of the Escanaba Kiwanis Club by Julie Mallard, the club’s secretary. She had seen a display of musical playground equipment at a Kiwanis convention and an advertisement for the equipment in an issue of Kiwanis Magazine. “When we had some extra money and wanted to do a project, I said ‘hey, how (about) this? '” she said. Other club members supported the idea. The project cost an estimated $25,000 in total, Mallard said. Funds for the project were raised through the annual Kiwanis Home and Garden Show and Pancake Days. There will be a ribbon cutting and dedication ceremony for the new musical playground Wednesday at Harbor Hideout in Ludington Park from 1 to 2 p.m. The ceremony will also mark the 25th anniversary of Harbor Hideout. The pieces of equipment installed last week are Rhapsody Outdoor Musical Instruments from Landscape Structures Inc.
Instruments featured in the Kiwanis Musical Playground include a metallophone, a set of chimes, a kettle drum, and a goblet drum. “Basically, they are concert-grade musical equipment that (encourage) people to interact and play music together,” Penchura Recreation Consultant Doug Smith said. Penchura is the company the Escanaba Kiwanis Club purchased this equipment from. Ludington Park’s new musical play area also includes a conductor’s podium. Mallard said this was an idea from Escanaba Kiwanis Club President Warren Isaacson. “We had U.P. Fabricating (Co., Inc.) help us with that one,” Mallard said. All of the equipment installed in this play area is ADA-compliant and handicap-accessible. “That was important to us,” Mallard said. According to Mallard, the installation of this equipment went well. “It actually went more quickly than we expected it to,” she said. Smith assisted club volunteers in their efforts to install the equipment, and concrete for the Kiwanis Musical Playground was poured by U.P. Concrete. Though its equipment has only been installed for a few days, Mallard said the Kiwanis Musical Playground has already been well-received. “There were kids coming up to start using it before we were even finished,” she said, noting that she has also seen posts about this area on Facebook. Mallard said the Escanaba Kiwanis Club is glad to have been able to donate this musical play area to Ludington Park and the City of Escanaba. “We really hope everyone will enjoy it,” she said. The Escanaba Kiwanis Club meets on Mondays at noon at Hereford and Hops. They also offer one evening meeting each month. For more information, find the club on Facebook.